I want to install a 2nd port into my MegaPot 1,2 10 gallon brew pot to support whirl pooling. Before I do, any suggestions where in the pot I should drill the hole? I have a Megapot with a false bottom and while I do go through a strainer on my way to the fermentor the false bottom really works well. One of the options discussed was to hang a copper tube over the side bent on an angle. No need to drill a hole with that solution. 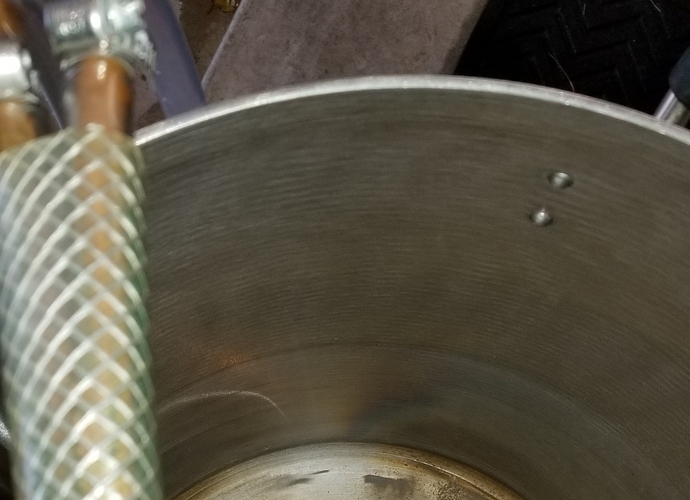 I looked at pics of other kettles with pre-drilled ports too and it looked like the whirlpool port was about a third of the way up from the bottom. Good luck! Copper tube over the side, or a weldless bulkhead with an elbow inside will work. I clamp my silicone tubing to the side during chilling / whirl-pool and that also works quite well. I agree a third of the way up is a good location. I am not against having trub in my fermentation tank. I may just try to whirlpool next time by clamping my return hose inside the pot and see how that goes as suggested above. Send me pics of your setup if possible for that scenario. Adding a 2nd port is very easy...I will just buy the same assemble that came with the MegaPot and install it same height as the Temp Probe (4 gal mark) and to the right 3-4 inches over (1/3 up as recommended here). It has to look good. There was a local brew off a few week back where this guy had a $6k Spike Brewing system. He had dedicated whirlpool ports and when he was finished, all of the Trub was in the center and none made it to the fermentation tank. Amazing. I use only 1 burner and 1 SS pump (for everything). Having a whirlpool with an Immersion Chiller means you don't have to keep moving the chiller for efficiency. That is being taken care of by the whirlpool. Wanted to try a NEIPA where alot of hops are added in the whirlpool stage. 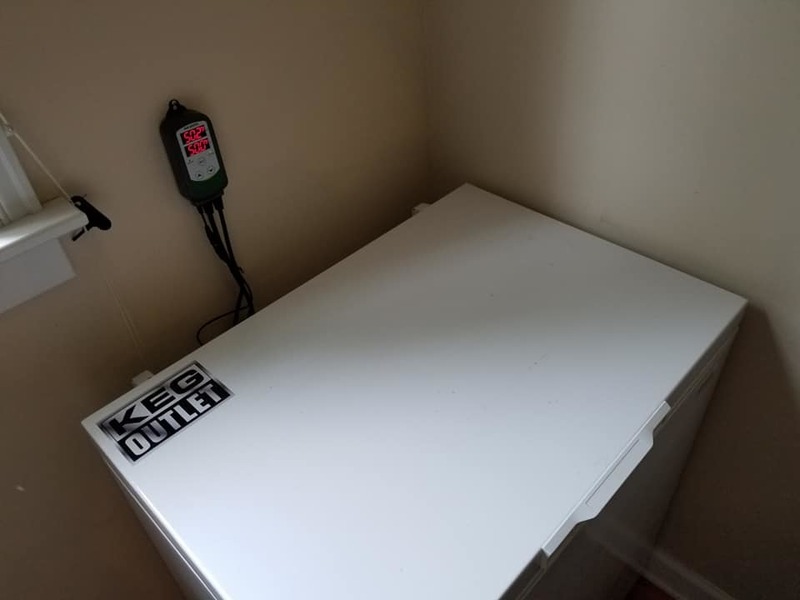 Created a Keezer recently (small deep freezer with Temp Controller added, nothing else). Use it for Lager fermentation now as well as Cold Crashing. 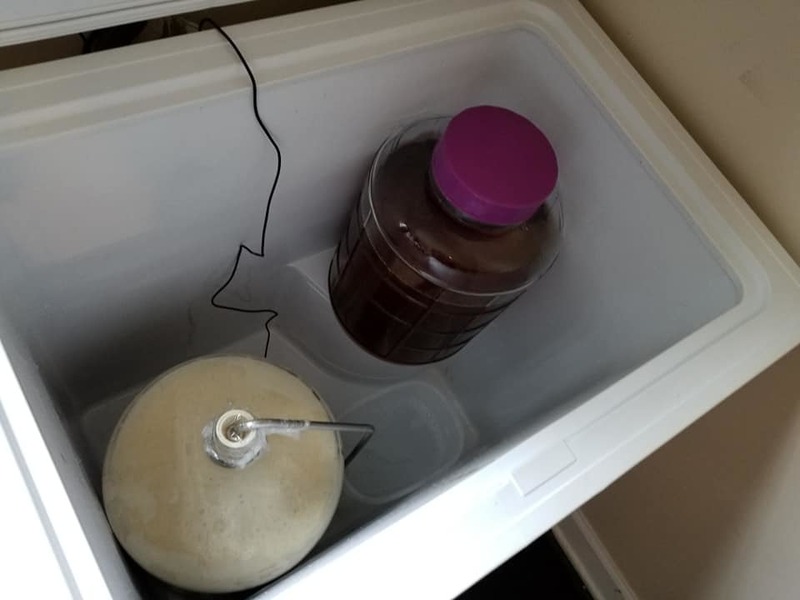 I currently use a 10 gallon cooler for my mash tun. And also have a 10 gallon cooler as a HLT (raised up where I pump Hot Water into it from my MegaPot). My MegaPot I use for HLT (HERMS) and/or Boil pot (5-6 Gallon batches). Sometimes I use my 13 gallon keggle as brewpot for 10 gallon batches. So I don't have a picture of mine all clamped together but I bought something like This (mine is stainless, don't remember where I bought it 4 or 5 years ago) and clamped it together with my immersion chiller. I've had very good success using this setup without drilling any holes in my kettle. Of course, this is a temporary cheap and easy measure and my preference would be to get a kettle with dedicated whirlpool port pre-installed but I'm not quite there yet. I may give that a try first. I could also use this to test for an optimal location for a permanent port. This is as close as I can find to a decent picture of my setup. The whirlpool arm is clamped in the center of my immersion chiller. As you can see I covered with super expensive high quality Reynolds wrap. I wanted to make sure all the work I was putting into getting aroma into my beer didn’t go to waste and evaporate out the top while whirlpooling. Typically I run 15-20 min whirlpool depending on the beer. I use this for my annual Off The Topper and Plinian Legacy batches, as well as Citra pales I've been working on recently in the spring and early summer. I tried 3 new things brewing yesterday (Sunday). 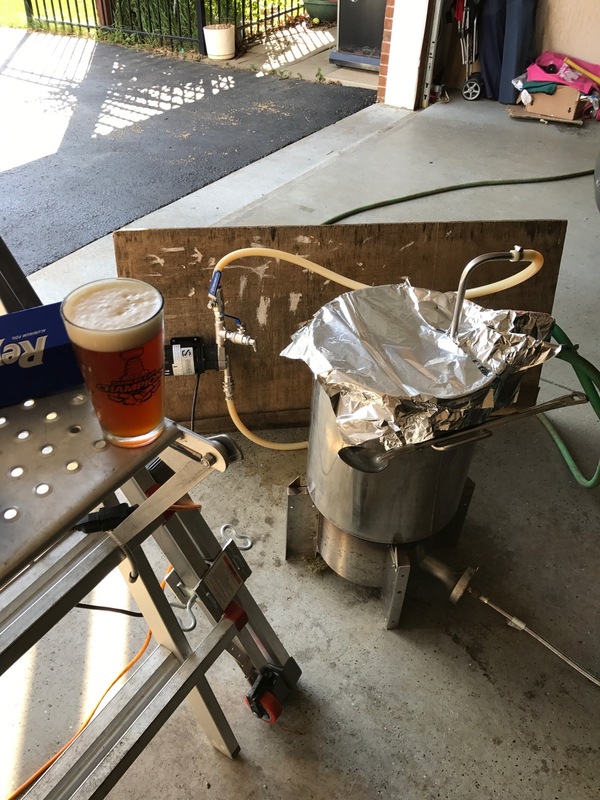 "If you are going to whirlpool, especially if you are going to add lots of hops during whirlpool with a NEIPA recipe, Make sure your hops are in a bag or SS can else your System will clog up..."
Glad it worked out for you Tom, I've been very happy with mine. Sorry to hear you got a clog, I've only had that issue on rare occasions, even with highly hopped beers, and typically shutting off the pump and restarting it blows it through again for me. I need to contain the hops but I think that I made it worse by having the Isoflow pointing straight down vs sideways. After giving up and cleaning the pump and hoses, I did not see any hops coming out of them so it must have been the Isoflow pipe being so close to the bottom of the pot (very efficient design) with tons of hops floating around. Will try this again in the near future.